In Italy, this was one of my favorite dishes to order. While I had never been to Italy before and I’m not of Italian decent, this was instantly comfort food, even though it was foreign to me. It didn’t hurt that it almost universally good. 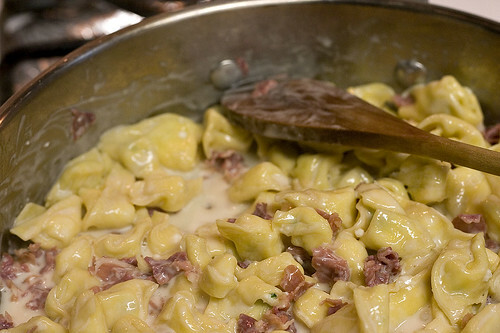 The first time I tried my own hand at tortellini panna e prosciutto the tortellini were my undoing. I decided to be a perfectionist and measure the size of each tortellini. It would’ve helped to keep them all the same size if I could cut straight. It ended up taking an inordinate amount of time: I think it took about 2 hours just to form them. I would’ve been hesitant to make them again but they’re really good. I’ve managed to get my tortellini making time to about 1 hour but that’s still a significant investment of time and energy. This is also probably not particularly good for you. The tortellini are filled with cheese. 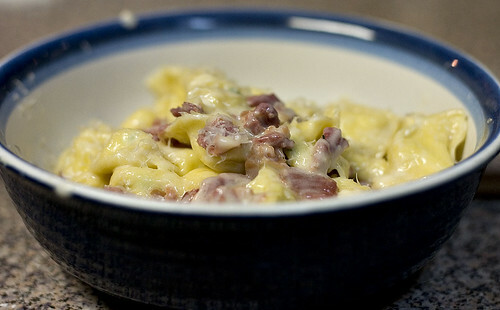 The sauce is similar to alfredo sauce but with prosciutto added. However, I probably burned enough calories making the tortellini. I’ve posted instructions for making pasta before. 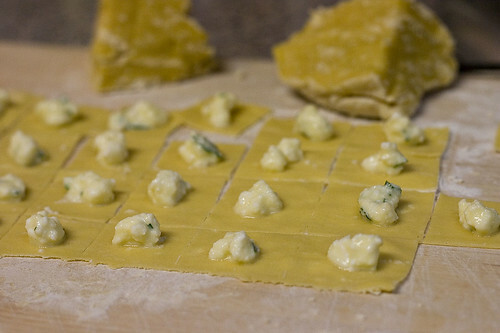 The tortellini recipe I use is basically the same that I use for cheese ravioli but in a different shape. You could also use fresh fettucini in place of the tortellini if you don’t want to invest as much time. It’s also sometimes served with peas (becoming tortellini panna, prosciutto e piselli) if you’d like it with a green vegetable. I always try and make enough so that I’ll have left-overs for lunch the next day but for some reason we always manage to eat them all. In a bowl, stir together the ricotta, parmesan, and parsley, attempting to break the ricotta into as small pieces as possible. Stir in one egg and season with salt and pepper. Set aside. Using the well method, mix the flour with the remaining 2 eggs to form a dough. Knead the dough briefly and then divide it into 4 pieces. Roll out 1 piece of dough to the thinest setting on a pasta machine. Using a pizza cutter, cut the dough into approximately 1 1/2″ squares. Discard any dough that is not approximately square. On each square, place about 1/4 tsp of the filling made previously. Fold each square in half by having two opposite corners meet, forming a isosceles triangle. Make sure that the dough forms a good seal. 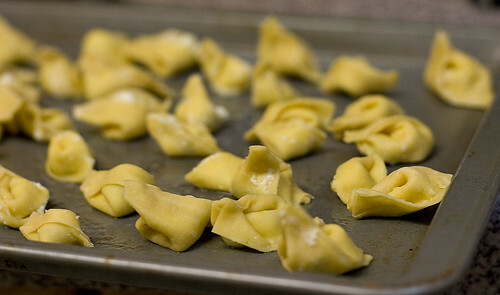 Pull the two corners of the triangle which form the longest side together to form the tortellini. Repeat with the remaining dough. Cook the tortellini in boiling salted water about 3 minutes or 1 minute after it floats. Melt the butter for the sauce in a large sauce pan over medium heat. When the butter is melted, add the prosciutto and sauté for about 4 minutes. Add the heavy cream and bring to a simmer and allow the cream to reduce. Stir in the parmesan cheese. When the pasta is done cooking, add the pasta to the sauce and cook for 1 minute more. Wow, I’m in awe of your homemade pasta! This dish looks mouth-watering. This looks so delicious! Great photos, can’t wait to try this dish. Your tortellini dish looks so creamy and tasty! Can I come over for dinner? Prosciutto, Parmesan, ricotta, cream. Oh my, it just doesn’t get any better than that. Thanks for the kind words. You can’t see it in the pictures but the tortellini started getting bigger as time went on. They still were good. Being an italian I must say, your recipe looks delicious. I only learned from my “Mama” to add mushrooms. Slice them and first saute the mushrooms and then add the rest of your recipe. It tastes very good!! We are military and were stationed in Italy for almost 4 yrs and this was my favorite meal while living there. I made it tonight and my family LOVED IT. Thanks for the great recipe! I was stationed in Naples, Italy for 5.5 years and this was also my favorite. You are right about it being comfort food. I have tried to replicate the sause but using store bought tortallini. This looks excelent and I will have to try it this weekend.